Once you have undertaken the purchase commitment for InClean products, we will provide the dispensers on a free loan basis. The future at hand: the latest and most innovative technologies applied to the most frequently used solutions in the bathroom area. The first and only dispenser with a "No-touch" proximity sensor; by simply moving your hand in front of the sensor, it dispenses the preset amount of pure cellulose hand paper towels, made of 4 biodegradable veils, to add further quality to the service. The best solution to control the hand paper towels consumption in heavy industry. 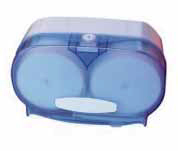 A dispenser with an automatic cutting mechanism, made of sturdy, wear resistant ABS. Also suitable for the food industry, where the presence of water and humidity creates problems in all the other controlled consumption dispensers. It works with TAD hand towels and has great autonomy and unmatched drying power. Easy to refill. Instant verification of product consumption levels thanks to the distinctive shaped glass. Rounded lines without sharp edges. Minimal amount of space required. Highly resistant ABS structure. A wide range of V and Z fold paper towels dispensers. Available in rugged ABS or stainless steel, both aimed at containing our items, such as the V fold 2 veils Blu Food, or the V fold 2 veils eco White, both high quality and affordable products. 2 and 4 rolls dispensers. The next paper roll is automatically activated when the previous one ends. Transport and storage space reduction, great autonomy, no wastes. Our company, in accordance with the latest regulations, only uses foam and spray dispensers with disposable refills. The system ensures a better control of consumption than any other dispensers, and the elimination of possible leakage of detergent from the dispenser. Our dispensers can be customized with your company logo. The foam is extremely delicate to hands and body, with more than 3000 services capacity. The spray version, also dermatologically tested, has a capacity of over 6000 services. A service so simple but also so important, to the point that our company only uses electronic dispensers with enzymatic biological activators, which not only gives color to the waters and deodorize, but also sanitize. InClean uses electronic dispensers, and/or the innovative automatic heating system, with eco-friendly refills. With these systems, and the possibility to choose among several persistent fragrances, we ensure the deodorization of the treated areas. We treat areas up to 150m².